Are you a WordPress developer? Do you want more control and performance as offered by WordPress? If your answer to both these questions is a ‘Yes’, then Craft CMS is for you. In this post, I’ll introduce you one of the finest alternatives to the globally popular WordPress CMS. As you read through the paragraphs, you’ll get to know the core features of Craft CMS which have allowed developers to think beyond the traditional WordPress CMS. So, let’s take onto this journey of unleashing everything about Craft CMS(Content Management System). Please Note: If you are not a developer or designer, then Craft CMS is not a good choice for you. 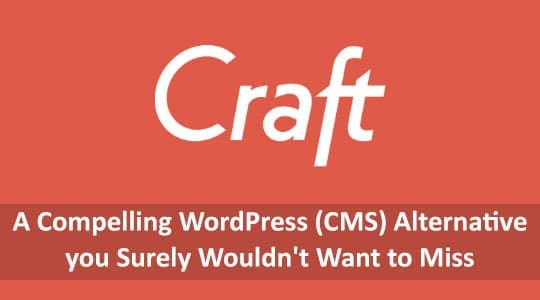 If you are only an end-user of WordPress, then you should not consider using Craft CMS as an alternative of WordPress. Craft CMS is good for them who design & develop websites for their clients. Quick reference links: Craft CMS official website | Craft CMS demo on GitHub repository. Quite similar to other CMS tools, Craft CMS is also equipped with a simple and completely responsive admin dashboard. 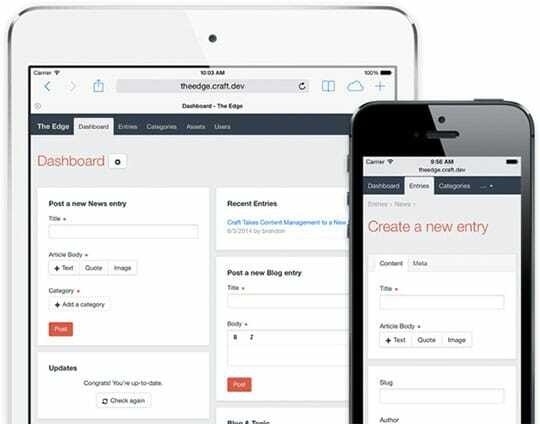 So, whether you’re an author or an editor, Craft CMS will render you the flexibility of managing your blog or website via your smartphone or tablet. Have a look at the below screen-shot which showcases the admin dashboard available with Craft CMS. One of the most stunning features available with Craft CMS is Matrix. It is basically a field type that allows you to incorporated extensive content flexibility into your WordPress powered blog or website. So, whether you want to store repeating content or want to group varied content types; Craft’s Matrix feature will do the magic. The greatest advantage of matrix fields is they can be used anywhere on the website. Plus, they can also be attached to users, tags, assets and global sets. Craft CMS comes with a unique feature of allowing admins to custom the default asset configurations for their WordPress blogs and websites. That means, with Craft CMS, you’ll be able to control the way your images appear on your site. Additionally, you can choose to control multiple website assets dynamically via templates. For the convenience of people who speak and understand different languages, the creators of Craft CMS have localized the tool’s administration user interface. That means, you can use Craft CMS’s admin user interface in 15 languages some of which include Arabic, Simplified Chinese, French, Dutch, German, Korean and many more. Not to forget, there is also a guide which offers you a stepwise explanation on the process of setting up a localized website. The publisher-oriented content model of Craft CMS is quite impressive. With sections and entries serving as their backbones, Craft CMS is a must-use for every WP blog author. Every entry within Craft’s content model has a unique author, a date, a status and a body content with an optional expiration date. With Craft CMS, you can find three different types of sections viz: singles i.e. the standalone pages, channels i.e. the blog entries and structure i.e. entries that require their own unique sorting order or hierarchy. Not to miss out, Craft also comes pre-loaded with categories and tags for the different entries. Craft comes with an extensive set of well-written documentation that guides you through all the steps that need to be performed for getting started with this exciting CMS tool. Also, a diverse, active and welcoming Craft developer community is there to listen and answer all your queries regarding the correct use of Craft. You can participate in Craft’s 24×7 weekly chat to receive useful advises from the experts. I’m sure the enticing features of Craft CMS covered above would have prompted you to install Craft and leverage its features to an optimum level. So, get going and witness the brilliance of this stunning CMS tool. This article is written by Savy Nacion. He is working as a technology specialist in Markupcloud, PSD to WordPress conversion Company, based in Rochester, New York. With over 10 years of experience in the technology domain, he aim at bringing new and innovative technology solutions to the company to help it keep thriving in the industry. Follow him on: Facebook | Twitter.